The fresh style of Sauvignon Blanc for which Geyser Peak is famous, abundant fruit flavors, with bright and crisp acidity. 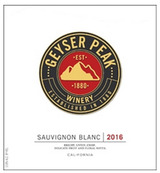 Geyser Peak aimed to capture the best of Sauvignon Blanc's identity by blending grassier elements (reminiscent of the Southern Hemisphere style) with citrus and mineral notes (most typical in the French style) and passion fruit and melon flavors (typical of the California New World style). As such, this Sauvignon Blanc offers authentic varietal character that can be appreciated by both the novice and the connoisseur. Best Buy. Aromas of snap peas and freshly cut grass lead to tangy lemon and grapefruit flavors in this medium-bodied, crisply balanced wine. It's certainly lively and will cut through the thickest fettuccine Alfredo.